I don't know if I somehow mangled a setting somewhere, but as far as I can tell everything is turned on. 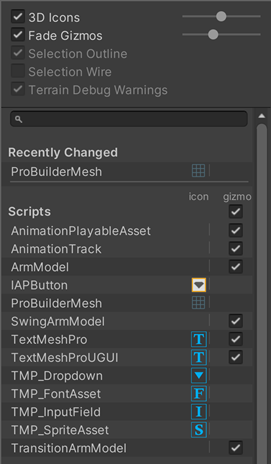 I'm using Unity 2018 and Gizmos seem to have stopped working in the Game View in my project. I wasn't doing a whole lot of coding for a while so I'm not exactly sure when this problem started, but it seems to have been sometime around when I updated to 2018. I have a small example project that they should be working on and don't seem to be for example. If this were a bug with 2018, I'd expect to see more people noticing it, so I think I did something stupid. I just don't see what. I have verified that they still work in Scene view, it's just Game View that is having troubles. Are you sure you have 3D Icons unchecked? Or checked with the slider value big enough? But it isn't just the icons, Debug.DrawLine/DrawRay and Gizmos.Draw[Anything] aren't working either. I have a related issue. All my icons from Gizmos folder which used to replace icons on Scriptable objects in Unity 2017 are no longer working as well (Unity 2018.2.11f1). (They were named "ScriptableObjectType icon" and used to work automatically). Is this feature no longer supported?